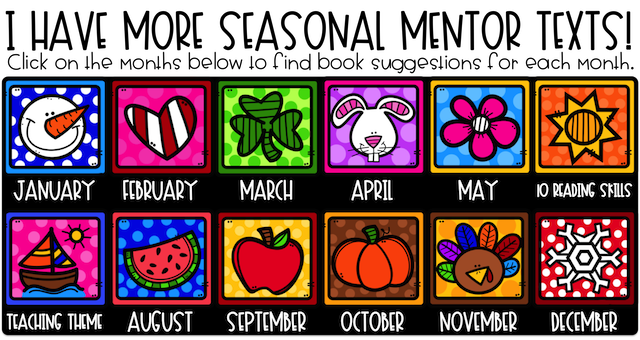 I absolutely love to embrace the chaos of the Christmas season and tie the holidays into my December lessons! I love to find ways to make learning engaging for my students and still focus on my grade level reading standards. Below are a few books that are perfect mentor texts for teaching various reading comprehension skills, like theme, story elements, and synthesizing. In this book, the Keeper of the Light is looking for a replacement. He asks everyone to bring a gift to the tree lighting ceremony. There, he will choose who will be the next Keeper of the Light. As the people of the village rush to the city's center with their gifts, the Keeper of the Light is disguised as a poor, old man. Only one child stopped to help--Alexander. While many citizens have given gifts, only Alexander has given well. He gave himself. He sacrificed missing the ceremony and the opportunity to become Keeper of the Light in order to help someone else. At the grocery store, Zetta wants nothing more than to be chosen to go home with a lovely family for the holidays. In her mind, that is what gives her a reason and a purpose. What happens to poinsettias after the holidays though? Will she be tossed out with the tree? What is her purpose? What was her reason "to be" as she says? She discovers that she can still be a gift to others. This book was honestly one I nearly skipped over. It seemed juvenile with its windows peeking through to the next page. But, those windows are exactly what make the theme of this book perfect. What you see through the window may not always be the truth. Things aren't always as they appear. I also love that this book has a second theme that is just as great. It teaches us to be thankful and make use of things that are given to us, even if it isn't exactly what you need. This book isn't tied to a particular reading comprehension skill as much as I'd like, but I love the fun that you can have with this book! I begin by asking my students how I am like an elf. They laugh. They look at me like I'm crazy, but they really begin to think critically think about ways that I might be like an elf. I like to do crafts. I like kids. I like to give! Then, I read the book. The narrator describes all the ways that the teacher is like an elf. She jingles when she walks down the hall. She sings, and she loves chocolate and cookies! Rachel doesn't celebrate Christmas. She celebrates Hanukkah. She wants nothing more than for Santa to come and visit her house. She writes him a letter. She sits on his lap at the mall, and she even leaves him a plate of latkes. By the end of the story, she begins to realize that every family and every religion have their own traditions. She learns that "...there are so many great holidays in the world, why feel bad about one little old day like Christmas?" I usually only show ONE graphic organizer for each book, even though there are always multiple skills that we can weave into a text. With Leo's Gift, I couldn't choose which was better. So, I broke my own rule and put them both! This is a lengthy text about a boy who discovers he has an amazing piano playing gift. His sister, on the other hand, does anything she can to avoid the piano and play basketball. Not only is Leo talented, but he also enjoys playing the piano so much. This book has multiple themes and so many connections that students could make with both Leo and his sister. If you are interested in the graphic organizers that I used in the pictures for Mentor Texts, you can find them in my TpT store, by clicking here. 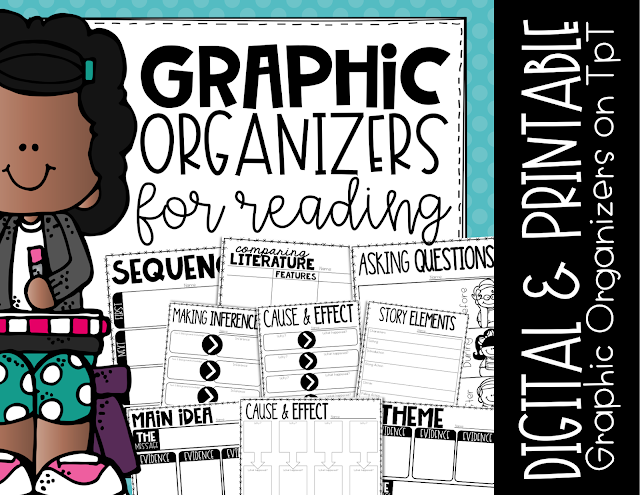 Included in the file, you find both digital and printable versions of each graphic organizer!